* Starts off like a campfire, there is smoke and flame with wood burning. * It might be starting like an ode to a religious ceremony, as that is a traditional use of oud. * The fire dims but the smoke stays a haze over sweet incense and resins. * Over the incense and resin, the woody oud comes through. It’s quiet and almost sheer. * The resins and light oud are joined by vanilla and amber, yet that smokey haze continues in the base. 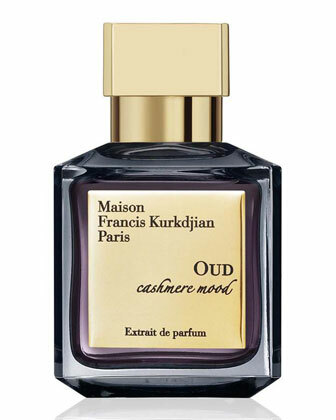 Summary: What I like about Cashmere mood is that it is not a generic “oud in your face” bomb. The oud is there but it’s subtle and incredibly well-blended. It smells nothing like what it does on a testing strip, so don’t even consider that as a facet. This is one that you have to wear on your skin to get a feel for. I think the scent is misnamed – cashmere is a soft, luxurious fabric. This scent is so smokey that I don’t think of that kind of luxury. Though maybe the link is the hazy scent and the light, hazy fabric of cashmere. The smokiness also ties it directly to Velvet Mood – as they are kind of like brothers. Projection is loud and brash for the first part of the development and even after it calms down, I think this is too much for an office scent. Maison Francis Kurkdjian fragrances are available at Neiman Marcus, Luckyscent, and Osswald. Disclaimer: Sample provided by store for review. Image courtesy of Neiman Marcus website.